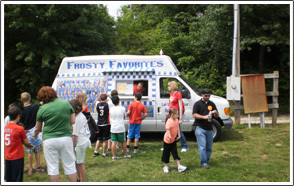 Frosty Favorites is an ice cream truck company that offers ice cream truck rentals to clients throughout the greater St. Louis area for parties and other special events. Whether you are planning a small birthday party or a huge company picnic, our ice cream trucks can provide the frosty ice cream treats to make your event special. We have many years experience serving customers throughout the St. Louis area. We sell our popular ice cream treats in neighborhoods around St. Louis and are pleased to offer ice cream truck rentals for parties and other special events. If you would like to learn more about having one of our ice cream trucks at your next outdoor event, please feel free to contact our St. Louis ice cream truck business. Frosty Favorites offers our ice cream truck rental services to private and corporate clients for special events and parties throughout the St. Louis area. We can drive our ice cream trucks to any location to offer ice cream catering services. Whether you are planning an event at your home, at a park, or at your company location, we can bring our wide selection of ice cream and frozen treats to your party. Our ice cream trucks are driven by professional and reliable attendants and are available anywhere throughout the St. Louis area. Our ice cream trucks are available for any special event or party including corporate events, school picnics, and private parties. With our complete selection of delicious ice cream treats, our ice cream trucks are loved by the entire family. Our menus include special character treats designed for children and low fat ice cream options for adults as well as a variety of the classic ice cream man favorites. With our large variety of ice cream man treats and frozen goodies, our ice cream trucks offer something for everyone. Our ice cream truck rentals are the perfect choice for any upcoming outdoor event. 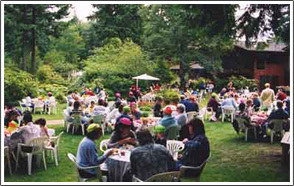 For example, corporate customers hire our ice cream trucks for corporate events such as company picnics, customer and employee appreciation days, grand opening celebrations, special sales and promotions, and more. Schools, parishes, churches, and day cares can hire our ice cream trucks for ice cream socials, field days, picnics, and other special events. We also offer our services to private customers for birthday parties, graduation parties, anniversary parties, weddings, holiday parties, bar and bat mitzvahs, and other special occasions. Our ice cream truck rentals make great surprises for small children and will make any event an enjoyable experience for the whole family. If you would like to have one of our ice cream trucks come to your special occasion, party, or upcoming event, please call us or email our ice cream truck business today for more information and to schedule an ice cream truck rental. Copyright Frosty Favorites - All rights reserved.